First, let me say that I love events. The connections. The energy in the room. The shiny handouts. The feeling that what you’re about to learn could change everything. 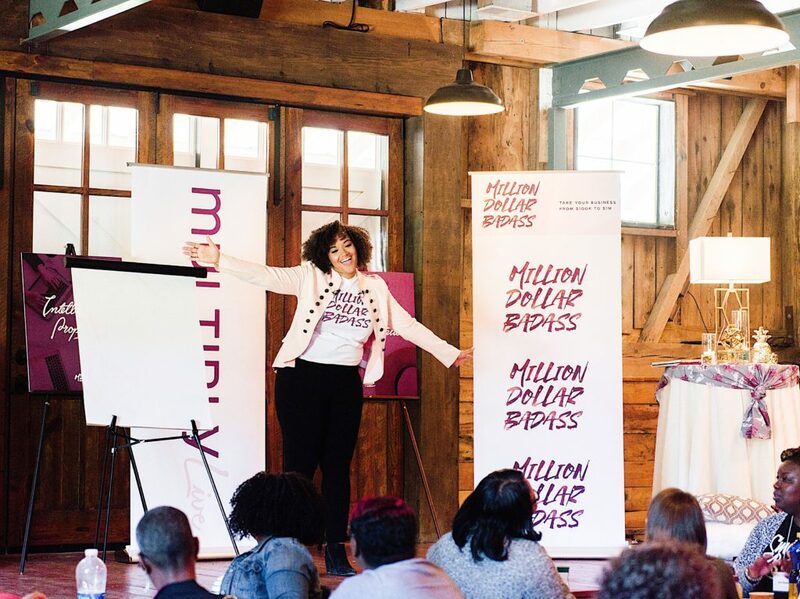 I’ve been doing live events and workshops for years—in New York City, Paris, Los Angeles, and in Greensboro (my own backyard)—and they’re a meaningful way of building my business and my audience. That’s also why I never did a virtual event. I got so much positive feedback from attendees of my live events, and I was worried people would feel they were missing out if they couldn’t be in the same room together. And then in 2018, I got pregnant with my fourth child . . . and put on bedrest. I couldn’t fly (or even stand) for the rest of my pregnancy. Which meant the blowout, totally-epic, confetti-falling-from-the-sky event I was planning had to be canceled. Not only had I been planning this event for months, and already had over 50 RSVPs . . . but I also was banking on the revenue the event would generate. So what’s a badass entrepreneur to do? 2.  There are people who won’t travel to your live events but would love to engage with your content (think parents of young children, international customers, or owners of brick-and-mortar businesses). 3. A virtual event gives you flexibility in a way that a live event never will. At the end of 2018, I asked my team to pull the numbers for all the events we did last year. I wanted to see which events cost the most, which events earned the most, and which events converted the most customers (which I consider anyone who becomes a customer within 30 days of attending an event). First, let’s talk about what an average event costs. Obviously, depending on where you live, where you’re hosting, and what level of event it is, the costs will vary drastically. But I reached out to an event planner I’ve worked with in the past and asked her to share some average numbers based on her 2018 events. 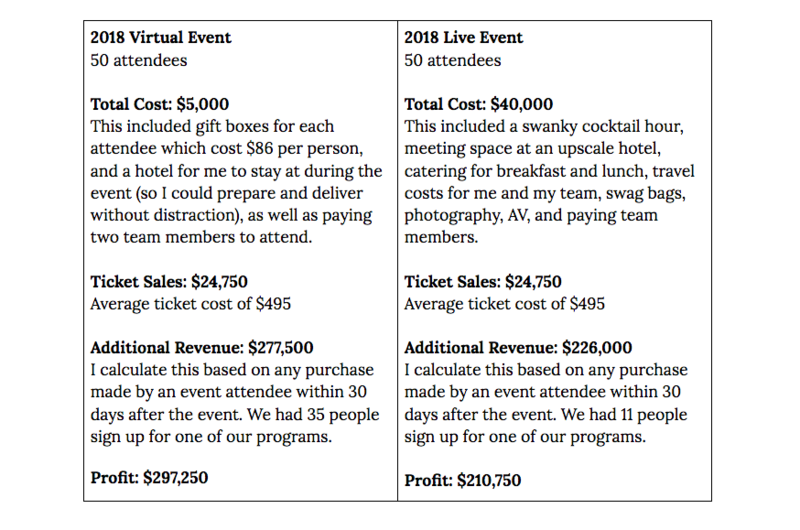 So what does it cost to put on a virtual event? Well, not much! Obviously, you’ll have to pay for marketing and advertising, but you would have to pay for that whether your event was virtual or live, so I’m going to leave that out of the calculation. The main cost of a virtual event is going to be any gifts or swag you send to the attendees, along with the hourly cost of your VA or team members. This could be as low as $500, and as high as $5000. Many clients tell me they don’t want to host virtual events because they think they can charge more for a live event, and that they’ll have to lower their ticket prices to convince people to attend their virtual event. What’s really of value to your customers? A free cup of coffee and a catered lunch? Or 8 hours of your time and attention, completely focused on them? When you price an event, whether or not it’s virtual or live, you should be charging for the value of your expertise. And you can convey a lot of value in 8 hours (or 6, or 4, etc.) whether in a virtual setting or in person. In short, don’t flinch from charging the same for a virtual event that you would for a live event. 1. Be crystal clear about what they’re going to get. Live events often lean on the amazing venue or the swanky cocktails to get people to buy tickets . . . and when you’re marketing a virtual event, you don’t have that luxury, which is great because it’s not really about that anyway. So let your content speak for itself. Make sure your copy makes it obvious what your attendees are going to get out of this event. 2. Set a cut-off date. This may seem counter-intuitive. If you can add people at the last minute, why wouldn’t you? However, the truth is you can’t add people at the last minute and still give them the full experience (particularly if you are shipping out swag bags). Be unapologetic about your virtual event offer (and frankly, all your offers). Price it according to it’s full value and stand by that price, by your virtual format and by your cut-off date without apology. You have put together a great offer, do not be sheepish about it. Be excited! Building engagement for a virtual event is key! 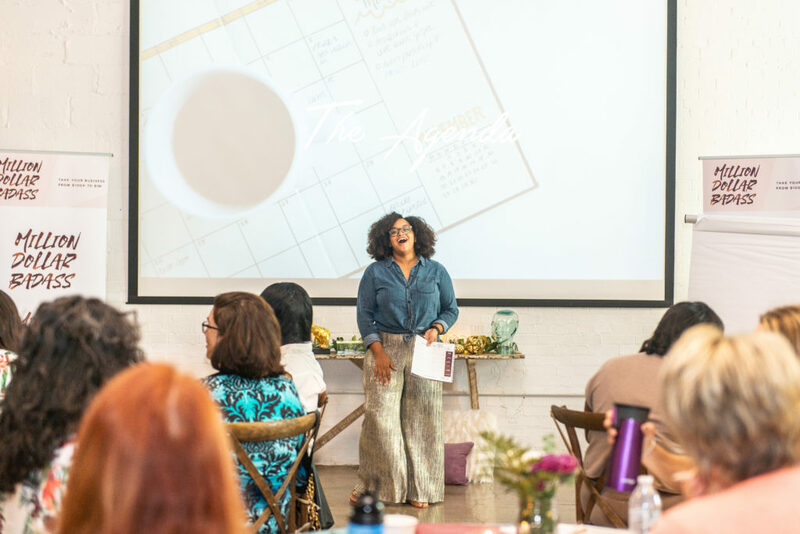 You want your attendees to feel the same energy and excitement as they would picking out an outfit to come to your live event. We also show up differently to an event that has already tried to engage with us, compared to an event where we haven’t heard a peep from the organizers beforehand. Engaging with your attendees beforehand shows them that they better take this seriously and bring their A game. So how can you connect with your attendees before your event? I reached out to each attendee after they purchased their ticket and asked them about their business goals for the year. Not only did this show them that I’m interested in their individual goals, it also helped me craft the content to fit what they were looking for and gave my team a talking point for outreach after the event. 2. Shower them with gifts. Two weeks before the event, I sent every attendee a gift box filled with materials for the workshop, yummy treats, a t-shirt to wear the day of, and some other adorable gifts. See the full contents of our gift boxes in the video below. The response was INSANE! So many of the women showed up to the event wearing their t-shirts, and it meant that people were tweeting and Instagramming about the event before it even began. 3. Stay in their inbox. Make sure to set up an email series that takes them from the purchase all the way up to the morning of the event. And don’t just remind them about how many days away the event is—get deeper! Ask them questions about their pain points, let them know what kind of participation you expect from them at the event, tell them why your material is essential to help them. This is the meat of your event! 75% off your time and focus should go to this part right here—what happens during your event. Every great event has a mix of content types: lecture, workshop, conversation, etc. Your virtual event is no different. Just because you’ve got 50 faces staring at you over Zoom does NOT mean that you can just talk at people for hours without structure. Plan your content the same as you would for a live event. That means you have a clear idea of what you’re teaching them, and you spend time creating exercises, worksheets, and interactive activities they can do. 1. Small Groups—depending on what video conferencing platform you use, you should have the ability to break attendees into small 2-4 person groups so they can have smaller discussions. (I use a regular Zoom meeting, and the host has the option to create breakout rooms.) This is a feature I use during introductions and after we’ve gone through particularly challenging exercises for small group coaching with my team or attendees to directly communicate with one another. 2. Physical elements—remember, sitting behind a computer screen all day isn’t always comfortable. I suggest having dance breaks, yoga during lunch, and other physical activities to help break up the day and get attendees laughing and enjoying themselves. 3. One-on-one conversations—Just because you’re presenting and can’t connect with each attendee doesn’t mean that somebody from your team can’t. During my virtual events, I make sure that I have a team member dedicated to watching the chat window, alerting me of any big questions or challenges, and having private conversations with attendees. This is a great way to support an attendee who might need extra attention or who would normally be asking a lot of questions that didn’t apply to the rest of the group, and it’s also a great way for your team members to start creating familiarity with each attendee’s circumstances so you can have a more targeted outreach campaign after the event. It amazes me how many incredible events I attend that, the second the event is over: radio silence. No follow up, no emails, no reminders…nothing! What people don’t realize is that right after an event, attendees are READY to become loyal customers for life. This is the PRIME time to sell your potential client an upgraded offer or tickets to your next event. If your attendee had an amazing time, got great results and loved the community, she probably wants to keep the party going. 2. Continue the connection—How can you keep the attendees connected to each other after the event? Can you create small accountability groups to meet for the 4 weeks following your event? Or maybe send an email list around with contact information? 3. The recording—This is more of a logistics thing: make sure to record your event, and don’t share it! Seriously, that recording is for internal use only. If somebody missed the event, don’t send them the recording. If they missed your live event, you wouldn’t send them a recording of that, so follow that same rule for your virtual event. 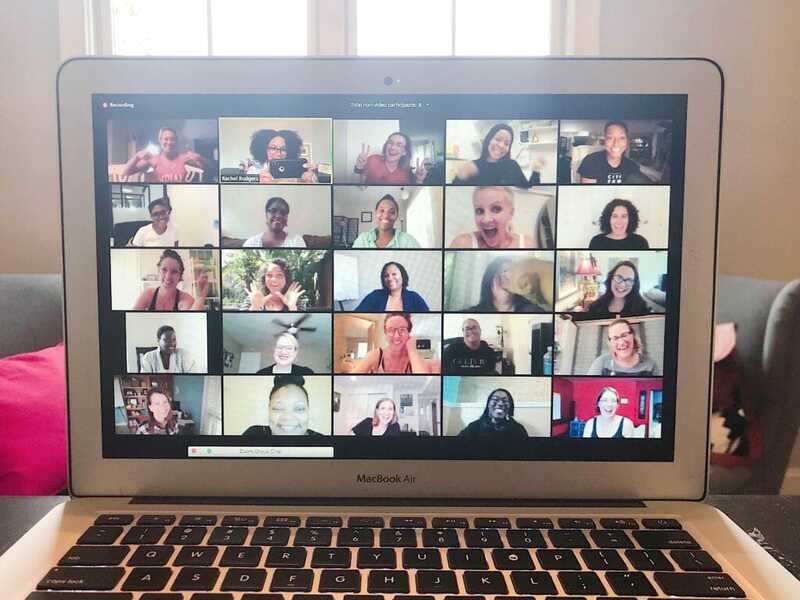 We made our virtual event recordings available to our Million Dollar Badass mastermind members only, event attendees did not get access to the recording. This is not a webinar, there is no replay. First, it’s low risk—even if only 10 people signed up, you wouldn’t lose money on a virtual event. Unlike a live event, where ticket sales can get straight up desperate as you struggle to at least break even on your costs. If you have never done an event before a virtual event is a great place to start. Second, it’s a great way to try out and refine your content—think of it as practice for that TedTalk or big keynote you’re prepping for. It allows you to get in front of your audience and present your goods. And it’s an exciting opportunity for your potential clients as well. Most people love to attend events around topics that they care about, and they may love it more when there are no travel costs to attend! Third, it might end up being the most powerful tool in your marketing toolbox! Most of my clients are surprised to find that virtual events are more profitable, less stressful, and convert at similar or sometimes higher rates than their live events. Don’t believe me? Try one for yourself! PS: We teach detailed strategies like this to our clients everyday (and we include templates and checklists and coaching too!). If you are a woman entrepreneur selling services and want to scale your business from $100k to $1m, book a call with our team to learn how we can help. PPS: Did you enjoy this article? We’d love it if you would share it with a friend! Click one of the icons below to share.